It's safe to say that as a white Scottish male, I am definitely not the targeted audience for the latest all female comedy 'Girls Trip'. In all honesty, I wasn't looking forward to seeing this film and didn't really expect anything from it. 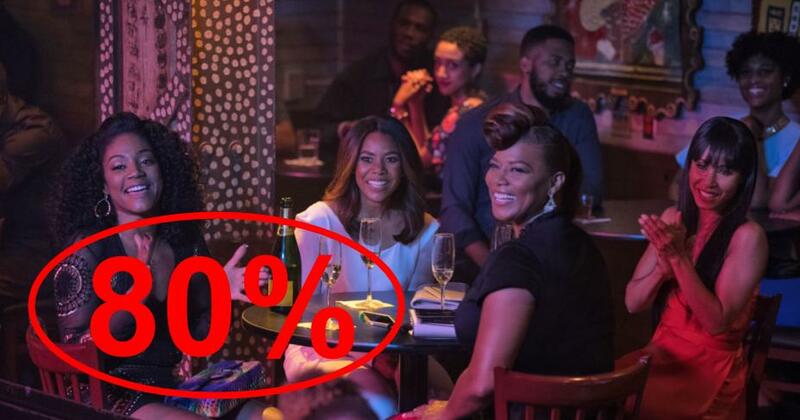 By the time the credits were rolling, I could happily say that this was time well spent as 'Girls Trip' is one of the biggest surprises for me this year. Best friends from college Ryan (Regina Hall), Sasha (Queen Latifah), Lisa (Jada Pinkett Smith) and Dina (Tiffany Haddish) reunite on a weekend trip to New Orleans for the annual Essence Festival. On this trip, the four will rekindle their friendship on a weekend filled with partying and dealing with problems old and new. In what seemed like yet another comedy featuring reckless partying with little consequence has surprisingly - to me - become one of the years best comedies. A simple premise that features four best friends reuniting seems like one that has been done to death but with 'Girls Trip', it feels like a breath of fresh air. The film combines raunchy humour with wild antics whilst developing personal issues that spill into the group incredibly well, creating a hilarious comedy in the meantime. 'Girls Trip's runtime comes in at just over 2 hours long which seems to be longer than your normal comedy film, especially one of this nature. You wouldn't think this however as the 2-hour runtime flies past in a flash. Despite a slow start regarding its comedy, the film soon becomes enthralling as the group is reunited. The four actresses involved possess fantastic chemistry that is absolutely essential for a film like this. The banter has to seem authentic and truly genuine which is executed perfectly by the way the cast bounce off of one another. Gross out humour doesn't usually work for me as the use of body parts for laughs seems too predictable and not funny as a punchline on its own. In saying this, in the instances where this humour is used in 'Girls Trip', it is used to great effect. The moments are truly shocking and catch you off guard that you can't help but react with laughter. By building up a joke and using this kind of humour throughout the process makes the eventual punchline that much funnier. The film's humour is a bit immature at times but for the most part, it is well thought out and executed. It's refreshing to see a comedy that doesn't feel lazy and takes easy ways out to get cheap laughs. There is proper build up, progression and continuation to make sure that the film gets as many laughs as possible which is succeeds massively with. The group dynamic isn't something that we haven't seen done with the characters possessing similar cliched personalities from comedies in the past. You have the wild one who doesn't care about what she does and doesn't think about consequence (Tiffany Haddish). There's the one settled with a family who needs to let loose after all these years (Jada Pinkett Smith). There's one who seems to be having some sort of crisis who requires help from another member of the group (Queen Latifah). And last of all, there's the one with the seemingly perfect life that doesn't turn out to be so perfect (Regina Hall). This dynamic isn't completely original but there is no problem with cliches as long as they are done well. These aspects all combine together to not only make a hilarious comedy but also do a great job with its more serious moments. With each of these personalities, you can see the conflicts of interest and this pans out very well in the story. The tension slowly rises between members of the group with personal issues of Ryan playing a huge part in the story that creates this rift. There is progression throughout the whole film with twists providing new information and effective drama that lead to an expected blow off at the end. And of course, with this being a film targeted towards groups of women, the main message is about sticking with your friends. This aspect is also handled incredibly well by not becoming overly cheesy. All that is needed is a speech that allows Hall to show off some of her acting chops to help bring an effective ending to this story. This isn't a family comedy by any means and you shouldn't watch this with a parent by any means. But this film is perfect for a group of friends to watch together as it is incredibly funny with a great story and an assuring message that will satisfy its audience. 'Girls Trip' shows that I shouldn't judge a book - film in this case - by its cover as it surprised the heck out of me. This is the best female driven comedy since 2011's 'Bridesmaids' and I'm glad to see that this film is doing so well at the box office. A great summer comedy that is an all round good time. So have you seen 'Girls Trip'? If so, what did you think of the film? I hope that this review was useful for if you were planning on seeing the film or not! Once again, thank you for taking the time to read my review, it is much appreciated!